Released October 7, 1917, Susie Slips One Over is a one-reel Black Diamond Comedy filmed and produced by the United States Motion Picture Corporation (USMPC) in Wilkes-Barre, Pennsylvania. The film was distributed by Paramount Pictures. An advertisement about the film appeared in the November 10, 1917 issue of The Moving Picture World says: “You needn’t be afraid to show Black Diamond Comedies to your most fastidious folks. They are just clean, rapid-fire fun, full of some of the best stunts in trick photography you ever saw–the kind of stunts that bring ’em back looking for more.” This echoes the advertisement campaign used by the USMPC for both Black Diamond Comedies and Rainbow Comedies–stressing that these films offer non-offensive fun for all audiences. The film stars Leatrice Joy as Susie, as well as a very athletic male co-star; these two are cast as lovers who try to elope one evening. Carl Dally appears as a farm hand who decides to rob the home of Susie’s parents the same evening. 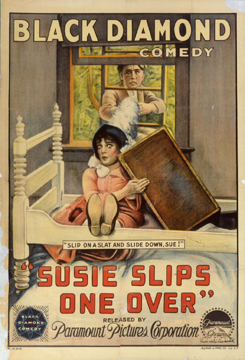 A single film print of Susie Slips One Over is known to exist; it is held at the UCLA Film and Television Archive, located on the campus of the University of California Los Angeles.The Academy of Motion Picture Arts and Sciences in Los Angeles also holds a poster for the film at the Margaret Herrick Library in the Fairbanks Center for Motion Picture Study in Beverly Hills. The UCLA Film and Television Archive digitized the film in 2013 and placed a DVD on permanent loan with the Luzerne County Historical Society archive in Wilkes-Barre, Pennsylvania.